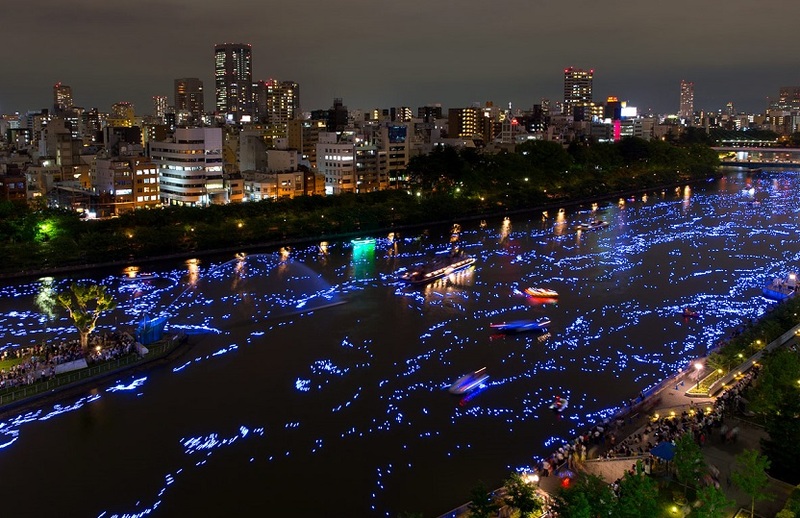 Both ultra-modern and deeply traditional, Japan’s magic will shock, awe and satiate every iota of wanderlust in you…. Most people associate the country with Mount Fuji, pretty hand fans and cherry blossoms; but for the eight-year-old version of me, ‘Japan’ invariably conjured up images of sumo wrestlers (thanks to my brother) and anime, Nintendo, Cup Noodles and my Aiwa Walkman. Very much a ’90s kid, even my favourite turtles were ninjas. Naturally, I had mused about visiting the country often; and assumed that I’d fit right in. “Safety is no concern but avoid straying from your group,” recommended a friend. I was told that Nippon, as the natives call it, is tough to navigate if you’re a gaijin or foreigner. There are barely any road signs in English (and their language is so nuanced that looking for translations online is futile). The culture is as exhilaratingly alien as anything on earth can be. The codes of etiquette will, likewise, throw you into the deep end. And boy can Japan be ‘deep’. There’s as much chance of getting it on a whirlwind first visit as there is of witnessing a mugging here — zero. Will I take to the country and its peculiarly flavoured soft drinks, I wonder, as I buckle up for my five days in the Kansai region in the main island of Honshu, the largest of the four that make up Japan. The sleek Japan Airlines Dreamliner, with its mood lighting, free Wi-Fi and high ceilings, succeeds in soothing me; our seats are equipped with charging points, USB ports, wide armrests. I plug in the noise-cancelling headphones and stretch my limbs (the leg space is enviable), resolving to travel light – by leaving all apprehensions behind in India. Less than 48 hours later, I am standing at the edge of a mountain — at a height of over 100 metres, despite my vertigo — and gazing at a two-mile-long pine-covered sand bar that cuts north-south across the Aso Inland Sea in Kyoto Prefecture’s Miyazu Bay. We’re in Kasamatsu Park, and the veritable slice of heaven stretching out in front of me is known as Amanohashidate. 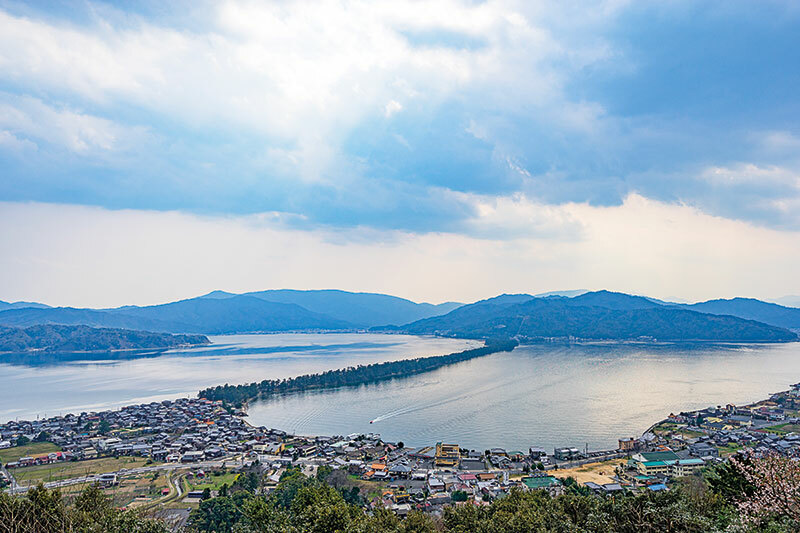 Located in the picturesque seaside town of Miyazu City, it is reportedly one of the three most scenic spots in the whole country. Turn around, bend down and view the sandspit from between the legs to attract good luck, I am coerced. And I am glad I am, for I feel duly rewarded when I see the panorama transforming into a “dragon rising towards the heavens” before my own eyes…. Maybe it is the myth that surrounds the strip peppered with the 8,000 odd pine trees: the gods are said to have once used it as a ladder or bridge to travel between earth and heaven. Or the kinship forged with the locals. Or perhaps it is the casualness with which those rare moments of realisation, of human transience and futility, sneak up on you when eased in by the sheer greatness of nature — putting things into perspective just like that. But I feel an intimate connection, a strong sense of belonging and familiarity in this extremely unfamiliar setting that is like and yet totally unlike the country I call home. When in Wakayama, head south to Mount Koya, known as Japan’s holiest mountain. It houses Koyasan (the suffix ‘san’ is equivalent to the Hindi ‘ji’ and is attached to the mountain out of reverence), the secluded headquarters of Shingon Buddism. The UNESCO World Heritage site, and spiritual heartland of the global superpower, was founded 12 centuries ago by the Buddhist monk Kukai, better known as Kobo Daishi, to spread this school of esoteric Buddhism. Today there are over 115 temples on top of the mountain, surrounded by 800-year-old cedar trees that shade, fortify and fiercely protect them from the outside world. More than 50 offer guest accommodations called shukubo, where visitors can experience a monk’s life; ironically, these don’t come cheap. Walk to Kongobuji, the head temple, and enter through the gate which dates back to 1593. The various rooms are adorned with Japanese fusuma screens from the Edo period 400 years ago, depicting seasons and scenes from Kukai’s life and serving as a perfect primer. This sprawling temple consists of a main hall, tea room, meditation hall, bell tower, mausoleum, study room and a rock garden. My favourite part of Koyasan, however, remains the enchanting cemetery grounds of Okunoin, the inner sanctuary and the site of Kukai’s mausoleum that reminds me vaguely of the Père Lachaise cemetery in Paris. The serene pathways are strewn with statues of bodhisattvas, row upon row of lanterns, monuments, mossy gravestones, cenotaphs and memorials. In a little alcove in the necropolis, we find the Miroku stone that we are encouraged to lift; after we have all failed, we are told about the legend behind it: apparently, the task can only be completed successfully by the one who has never sinned. I quickly learn about Fushimi Inari, a Shinto shrine in Kyoto’s famous sake district of Fushimi. It is famous for the thousands of vermilion toriis or gates that lead into the wooded forest of another sacred mountain, Inari. Built in 711 AD and considered the most popular shrine in the Land of the Rising Sun — and the number of visitors certainly corroborates that fact — it is said to be guarded by its numerous statues of foxes (said to be the messengers of Inari, the god of good harvest, business and rice; the last remains an all-important component in Japanese cuisine till date). “They chase away the mice from the rice,” chuckles a local, eyes twinkling, when I ask him if there’s any truth to the lore. If Koyasan was solemn and spiritual, Fushimi Inari is bustling, with a lightness that is equally uplifting. The lively streets around the shrine complex fall in the popular Higayashima district that leads to the Kiyomizu temple (famous for being built without a single nail). All colour, the alleys here are dotted with shops, markets, houses with tiled roofs, restaurants, cafes and stalls selling street food (cuttlefish on a skewer, anyone?). 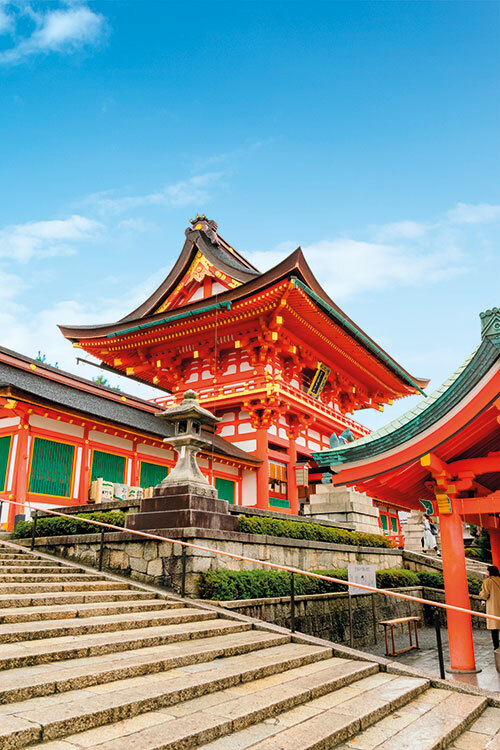 Stroll around and experience traditional Kyoto — the imperial capital for more than 1,000 years — through the charming old winding lanes that sell all kinds of souvenirs and knick-knacks. If you haven’t had your fill of shopping, head to downtown Kyoto’s hip Shinkyogoku arcades; buy handicrafts or speciality foods, or simply enjoy a walk as you window-shop around the covered market. It’s dinner time and I’m expecting sushi, ramen and sashimi, but I find a diverse variety that I didn’t know existed — tsukemono (pickled cabbage, raddish, brinjal), namasu (salad comprising thinly sliced veggies soaked in rice vinegar), soba (buckwheat udon), konnyaku (thin gelatinous slices of the yam-like konjac root) and rice balls, all typically served in tiny lacquer and ceramic bowls…. Warning: it’s considered bad manners to leave anything on your plate, so best not to over-order unless you are confident that you are not biting off more than you can chew. 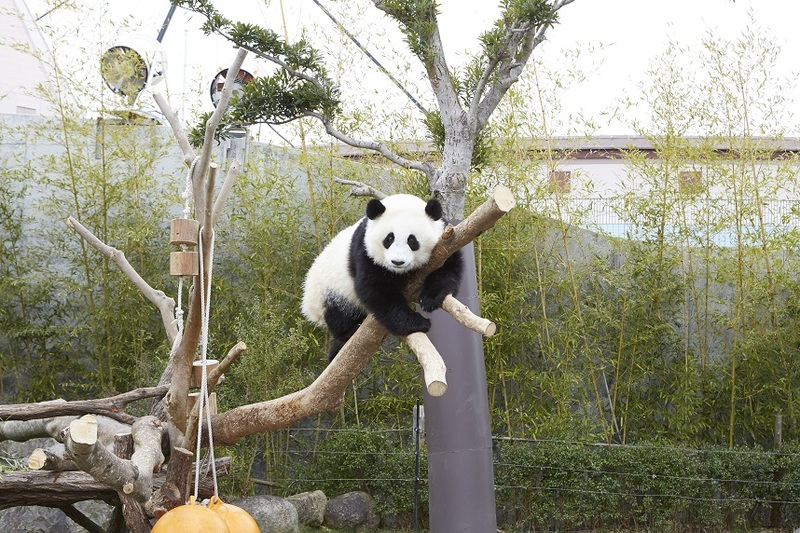 Apart from pandas and selfies, the Japanese are mad about tofu. 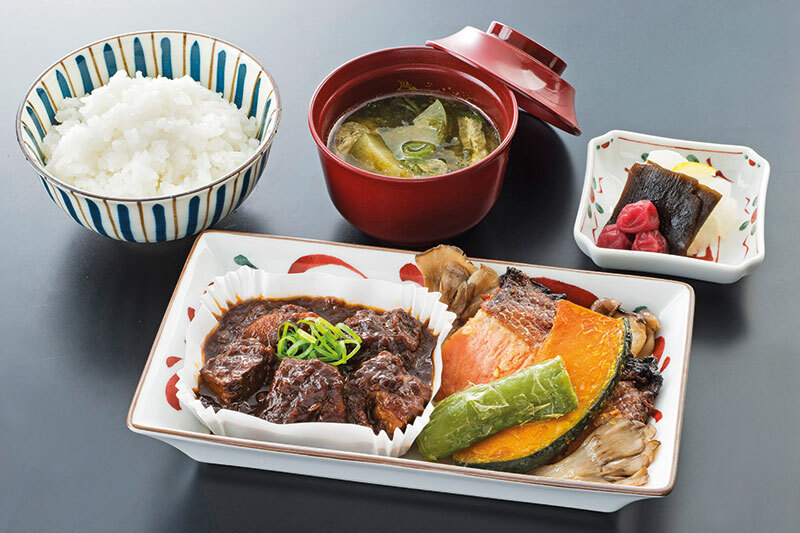 A lunch in Kyoto consists of mostly tofu — fried tofu, silken tofu, boiled tofu, sesame tofu and tofu pudding for dessert. Believed to be the favourite food of the fox messengers, let’s just say that it’s not for the faint-hearted. 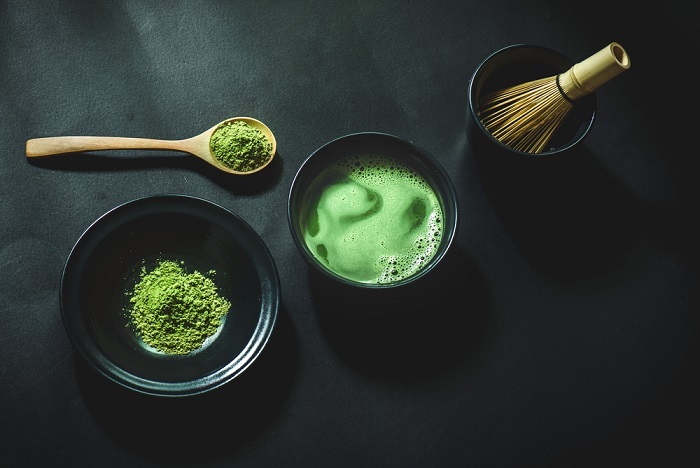 The locals also love their matcha (the frothy Japanese tea is not like the teabag Typhoo green tea that I am used to back home) — and their miso is nothing like the adapted-to-taste, diluted version I’ve eaten in India or Europe. Here you will find Kit Kats in a variety of flavours like sake, edamame, red bean, chilli, potato and wasabi, and matcha-flavoured everything — chocolates, toffees, ice cream…and even the salt that seasons the tempura! All of it tastes unfamiliar, the flavour itself difficult to pinpoint. Grand reveal – it’s umami. The fifth taste, which is predominant in most food items here, has been now embraced by high-profile Michelin chefs the world over. Will the black sesame ice cream be able to generate the same sort of buzz among foodies? Only time will tell. Every time we walk out of prayer halls, we notice our temple slippers rearranged neatly in pristine rows. Perfect symmetry, this is a quirk that fully satisfies my penchant for precision. This ties in with our itinerary — ‘Reach Wakayama Station at 8.43’. Do I dare hope that this is not a typo but deliberate? I pop into a shop selling all kinds of bric-a-brac in Kyoto to buy some beautifully packaged calligraphy pens, and watch in awe as the shopkeeper wraps them, unrushed, creasing the paper identically each time, every fold in place. Later on in the day, the inevitable happens and I lose my way. I’m duly informed by my generally-trusty Google Maps that I’m nothing more than a dot in a sea of people, before my 3G lets me down. Luckily, I spot the only Japanese word I can read — Uniqlo. In the store, I pick up a tee with some Japanese characters; only to find that the five-line English ‘translation’ on the price tag is total hogwash. In Japan, the only rules that matter are theirs. When in Japan, keep an eye out for restaurant windows adorned by very realistic, delicious-looking ‘food’ that is all synthetic. Plastic food in this first-world nation is a billion-dollar industry. They’ve got it down to an art form, like most things here. The land of Hello Kitty and Super Mario is clearly a study in the bizarre and the natives make no bones about it. PM Shinzo Abe dressing up as the latter at the closing ceremony of the Rio Games to give the world a taste of Tokyo 2020 (where’s that emoji when I need one?) wasn’t a cheap stunt – it was designed to break the internet, which it did. Charmed by tourist ‘hotspot’ Shirahama’s hot springs (onsens) and stretches of talcum-fine white beaches? You’ve just been had again. It’s been imported thousands of miles from Australia’s Gold Coast to make up for the natural erosion. Just when I thought that I had seen it all, I hear about the neighbouring town Kishi’s cat stationmaster. 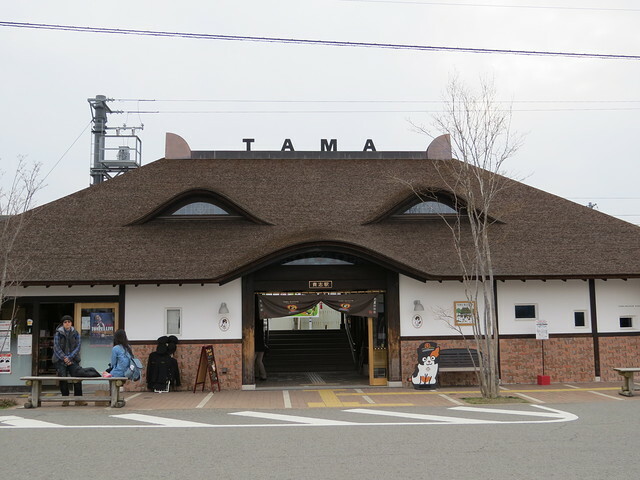 Sadly, Tama passed away last year. Her funeral was attended by 3,000 people…and now she has been given the status of a Shinto goddess! While there is enough history to be transported back in time, the big cities are so high on tech that they are almost futuristic. Warmed toilet seats, hot food vending machines, automated taxi doors, the Shinkansen bullet trains…. Cosmopolitan Osaka’s 173-metre Umeda Sky Building, designed by Hiroshi Hara, has a rooftop Floating Garden Observatory providing a 360-degree view of the global megacity. 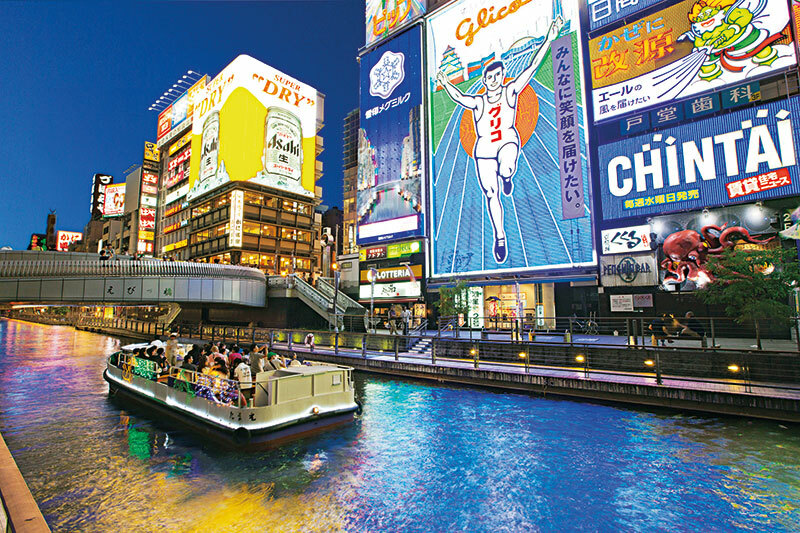 Don’t miss out on the historic Osaka Castle, the canal-side Dotonbori district’s famous Times Square-ish signboards, 24-hour shopping centres and Universal Studios Japan while here. If for you, travelling is about experiencing something new, you’ve lucked out. A word of advice though: expect the unexpected. I armed myself with the weapon of my choice — a sense of humour. Surreal and disorienting though at times, mainly due to language and cultural barriers, I will always treasure how deliciously far removed in time and from the familiar I had felt in the Far Eastern country, a most enriching authentic unique sensory experience which is impossible to replicate anywhere else in the world. 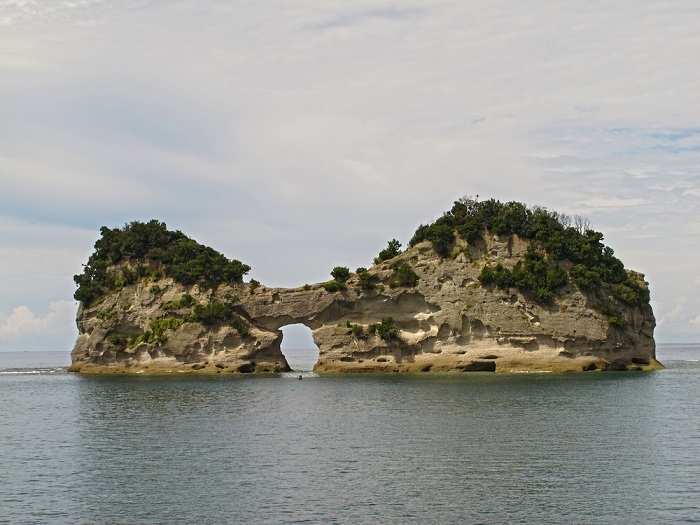 Just off the coast stands Engetsuto, a naturally curved island with a hole right through it. Here, you can catch one of the best views of the sunset in the region. The expanse of glistening aquamarine, the surreal full-moon-shaped hole, the enthralling view through the opening…. As far as natural beauty goes, you don’t need a pirate to tell you that Shirahama, with its vast swathes of virgin landscape and beaches, is the treasure trove in plain sight here. And if its adventure that you seek, travel down 36 metres on the elevator from the cliff face to Sandanbeki Doukutsu, a cave which houses a museum and shrine inside. Once a secret lair of the formidable Kumano pirates more than 1,000 years ago, it is Benzaiten, the deity of everything that flows (water, knowledge, music and eloquence) – derived from Saraswati – who is worshipped here. I watch choppy bluish-green waters crash against the rocks in the monsoon evening, frothing now and then to add a dash of tempestuous beauty to the scenery. Drink sake or the fruity umeshu, a Japanese plum liqueur. Or go for beers Asahi, Sapporo or half-and-half — half local lager underneath Guinness. All are equally satisfying. Buy any of the various types of wooden plaques at shrines to write down your dreams and wishes on; traditional blue-and-white tea sets; pens with erasers that erase pen marks! Explore Ine, a sleepy fishing village with mountains on one side, in the prefecture of Kyoto. It is one of the first spots of civilisation in Japan and about an hour away from Amanohashidate. Find yourself a funaya or houseboat out of the hundreds that line the bay to stay in.